Mother Goose Time at Halloween is more about parents/nannies dressing the kids up in costumes and the kids not being happy about it. Last week, in fact, I told the parents I would open the story room 10 minutes early so that they can take pictures to their heart's content, and then divest the kids of any uncomfortable clothes during the program! 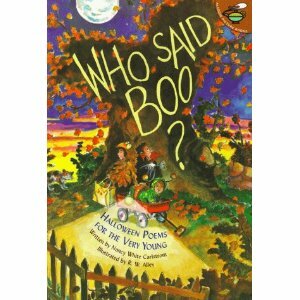 We'll do spider songs--"Itsy Bitsy/Eeency Weency" is popular year round, of course. And then the basket the usually contains various animal puppets for "Grandpa's Farm" will have a spider puppet in it so we can sing Raffi's "Spider on the Floor". This is an ideal "tickle" song and also, of course, names parts of the body. This video has Raffi's original version, plus some funny spider pictures--arachnophobic types, beware! This is the way the cats walk, the cats walk, the cats walk. This is the way the cats walk on Halloween night. Pit! Pat! Pit Pat! Pit! Pat! And it occurred to me the other day that I COULD add my own verse--about the bats flying. They are going to go FLIP-FLAP! Coming as soon as I can get it up here: some extra special Halloween stories!